The National Hurricane Center says excessive amounts of rain are being dumped on the state. It says the effect is expected to be “catastrophic.” In its 11 p.m. update Saturday, the center also says an elevated risk of landslides is now expected in western North Carolina as heavy rains spread there. And the threat is not only limited to the North Carolina and South Carolina. Forecasters say heavy rains are eventually expected early in the week to head into parts of West Virginia and the west-central portion of Virginia — also at a risk of dangerous flash floods and river flooding in those states. 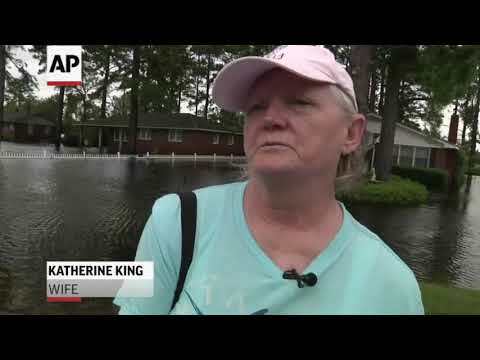 Record flooding is expected on North Carolina’s Cape Fear River in the coming week, and signs of the coming flood are already apparent. Duke spokeswoman Paige Sheehan said Saturday evening that about 2,000 cubic yards (1,530 cubic meters) of ash have been displaced at the Sutton Plant and that contaminated storm water likely flowed into Sutton Lake, the plant’s cooling pond. The company hasn’t yet determined if the weir that drains the cooling pond was open or whether any contamination may have flowed into the swollen Cape Fear River. In a tweet Saturday evening, Trump said five deaths had been recorded so far in the storm’s wake. Officials had already raised the death toll to 11 by the time of the tweet, which followed a White House briefing. Some of North Carolina’s largest public universities are canceling classes a little longer because travel remains uncertain and risky while Florence lingers in the region. The University of North Carolina at Chapel Hill and North Carolina State University in Raleigh both announced Saturday that they would resume classes Tuesday. East Carolina University in Greenville —which is closer to the coast— plans to re-open Wednesday. President Donald Trump was briefed by telephone Saturday on Florence’s impact on the East Coast. No details about the content of the president’s briefing were released. The head of U.S. Northern Command, Air Force Gen. Terrence J. O’Shaughnessy, tells The Associated Press that Marine MV-22 Osprey aircraft are preparing to launch off Navy ships heading toward the coast, to provide greater awareness of what’s going, particularly in North Carolina. O’Shaughnessy says Northern Command is also using two airborne early warning radar and surveillance aircraft, flying above the storm, to assess bridges, roads and other infrastructure. The aircraft are also able to help relay communications from low-flying helicopters to the FAA if transmissions are affected by storm. O’Shaughnessy says he expects helicopters and high-water vehicles will be the greatest need. Transportation officials dealing with worsening roads because of Florence have a message for out-of-state motorists traveling through North Carolina: Please don’t use our highways. A 16-mile (25-kilometer) stretch of Interstate 95 is already closed, and Trogdon expects other portions of the road to be shut down near Lumberton as the Lumber River’s levels rise there. And a smaller portion of Interstate 40 is shut down. The city said in a statement Saturday that 455 people in all were rescued from Florence’s floodwaters. Waters began rising there late Thursday as Florence approached as a hurricane. New Bern spokeswoman Colleen Roberts says there were no significant injuries reported during the rescues, and there have been no fatalities in the city. She says a round-the-clock curfew is in effect until Monday morning, meaning residents shouldn’t be out on the streets. Florence’s heavy rainfall is forecast to continue, potentially causing catastrophic inland flooding. The hurricane center says some areas along North Carolina’s coast could see up to 40 inches (100 centimeters) of total rain by the time Florence passes through early next week. At 5 p.m. Saturday, Florence was barely crawling west at 2 mph (3.2 kph), with its center located about 60 miles (95 kilometers) west of Myrtle Beach, South Carolina. Florence’s top sustained winds were holding at 45 mph (75 kph). A 16-mile (25-kilometer) stretch of I-95 between its intersection with I-40 — near the town of Dunn — was already closed Saturday. Law enforcement has set up a detour. A herd of wild horses that roams a northern portion of North Carolina’s Outer Banks has survived Florence just fine. The Cape Lookout National Seashore said in a Facebook post that it would provide an update on a herd of horses at another location — Shackleford Banks — just as soon as staff could return to do condition assessments. A mandatory evacuation order has been issued in North Carolina’s Cumberland County and the towns of Linden and Wade for anyone living within a mile (1.6 kilometers) of the banks of the Cape Fear and Little rivers. Regarding the evacuation order, Kicklighter says the family would “probably stay” because “I think we’re pretty much out of the way of” the mile radius. The IRS said Saturday it’s offering the relief in parts of North Carolina and other regions designated a disaster area by the Federal Emergency Management Agency. South Carolina Gov. Henry McMaster is reopening the state’s government next week, but state officials are warning that the danger of significant flooding will persist. State Transportation Secretary Christy Hall told reporters on Saturday that her agency is closely monitoring four bridges in the state’s northeastern section that are in danger of being washed over. Hall says those bridges are in areas that experienced significant flooding after 2016′s Hurricane Matthew. McMaster has lifted evacuation orders along much of South Carolina’s coast. Horry and Georgetown counties in the state’s northeastern portion are still under mandatory evacuation. McMaster says state offices that have been closed during the storm will re-open Monday. Asked if he had spoken with President Donald Trump —a politically ally whom McMaster backed very early in the 2016 campaign— the governor says the president reassured him South Carolina would get federal assistance to dig out. “He has said they would do whatever it takes to see that everything is available for South Carolina,” McMaster said. Many residents who evacuated North Carolina’s Outer Banks ahead of Hurricane Florence are making their way back onto the barrier islands, which were spared from the worst of the storm’s wrath. The Associated Press was unable to get details because the sheriff’s office phone line was not working. Hurricane Florence evacuees from the Carolinas are getting free tickets to watch the University of Florida’s football team play Colorado State. The ticket office and athletic association at the University of Florida extended the invitation to evacuees for Saturday’s game at Ben Hill Griffin Stadium in Gainesville, Florida. Gator officials say evacuees had to present a valid ID showing they’re from North Carolina or South Carolina. The National Hurricane Center said Florence’s top sustained winds were holding at 45 mph (75 kph), with higher gusts east of the storm’s center. Tropical storm-force winds stretched up to 150 miles (240 kilometers) from the storm’s center. Officials in South Carolina are reporting the state’s first fatality due to Florence, bringing the storm’s overall death toll to at least five. The tree was about 6 feet above the road surface. Hughes said the vehicle’s roof is what struck the tree. Portions of eastern North Carolina’s two interstates are closed because of flooding caused by Tropical Storm Florence’s torrential rains and may not re-open before Monday. A Navy statement says the decision comes after inspections of the region’s port and airfield. The National Hurricane Center said Florence’s top sustained winds have weakened to 45 mph (75 kph). The storm’s extremely slow speed means the risk of catastrophic flooding remains high across both states. Some areas are forecast to receive up to 15 inches more rain, and storm totals could reach over 3 feet in some areas for the week. National Hurricane Center Director Ken Graham says areas like New Bern, North Carolina, could also see additional storm surge as high tide combines with the ocean waters still being pushed ashore by Florence’s outer bands. Tropical Storm Florence is practically stalled over the Carolinas and the monster storm could dump drenching rains of up to 3½ feet (1 meter). That, in turn, could trigger epic flooding well inland. North Carolina Gov. Roy Cooper calls Florence the “uninvited brute” that could wipe out entire communities. The storm is some 400 miles (645 kilometers) wide. Power outages are widespread including over 740,000 in North Carolina and 163,000 in South Carolina. Rescue crews have used boats to reach hundreds besieged by the rising waters. Early Saturday morning Florence’s winds weakened to 65 mph (100 kph) as it moved forward at 5 mph (7 kph) and was about 15 miles (25 kilometers) west northwest of Myrtle Beach, South Carolina. At least four people have died since Hurricane Florence crashed into the coast Friday and nearly stalled. Though forecasters later downgraded Florence to a tropical storm, the monster system is barely moving over the Carolinas and could dump drenching rains of up to 3½ feet (1 meter). That, in turn, could trigger epic flooding well inland. North Carolina Gov. Roy Cooper calls Florence the “uninvited brute” that could wipe out entire communities. The storm is some 400 miles (645 kilometers) wide. Power outages are widespread, and rescue crews have used boats to reach hundreds besieged by the rising waters.